Today I have a secret recipe for a tasty shareable appetizer served at Outback Steakhouse. If you enjoy cheesy fries, then the Aussie cheese fries are just for you. 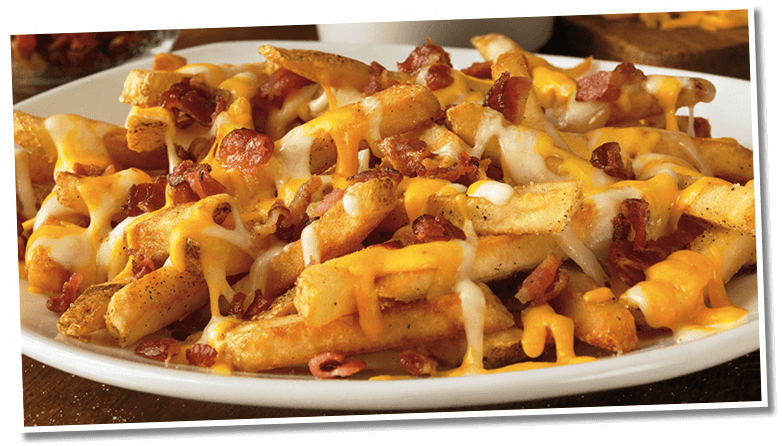 Crispy fries are topped with melted Monterey Jack, Cheddar and chopped bacon. Serve this with ranch dressing on the side. I recommend making the fried with an air fryer if you have one, otherwise baking them still produces great results. Eat This ONE Unusual Morning Pastry To Lose Belly Fat Before Midnight! Spread fries onto baking sheet. Bake according to package directions. Cook bacon until crispy in skillet, drain on paper towel, and chop. When fries are crispy, remove from oven, season with salt and pepper. Pile fries into the center of the pan. Put back in oven for another 3-5 minutes to melt cheese. Remove and top with green onions. Today I have a secret recipe for a wonderful salad served at Outback Steakhouse. This salad can be enjoyed as a lunch or as a first course with your dinner. Chopped mixed greens with shredded cabbage and carrots are tossed with a blue cheese vinaigrette and topped with more blue cheese crumbles and cinnamon pecans for a nice crunch. Combine the pecans, ground cinnamon, melted butter and light brown sugar in a bowl. Toss to coat well; then place on a baking sheet and cook in a preheated 375 degree F oven for about 3-5 minutes. To make the dressing, whisk together all ingredients until well blended. To make the salad, mix together salad ingredients. Drizzle with the dressing and then top with the cinnamon pecans. Today I have a secret recipe for a delicious appetizer served at Outback Steakhouse. 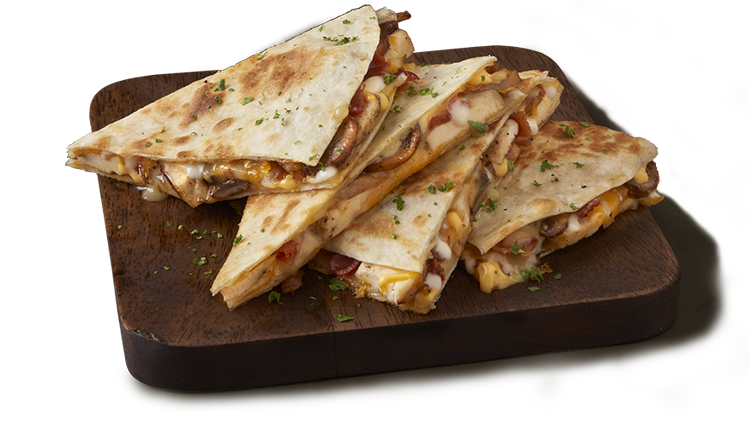 The Alice Springs Chicken Quesadillas are stuffed with fresh grilled chicken breast, sauteed mushrooms, bacon, melted cheeses and honey mustard sauce. To save time with this recipe you can pick up a package of already cooked chicken breast from your local grocery store. Prepare the honey mustard by combining the mayonnaise, mustard, and honey in a small bowl. Mix well and set aside. Slice the chicken breast on the diagonal into short slices about 1/4 inch thick; set aside. Use nonstick spray or about 1/2 teaspoon butter to coat the surface of a skillet or grill, heat it to approximately 350 degrees. Saute the mushrooms over medium-high in a skill with 2 teaspoons butter, garlic salt, and parsley. Cook the mushrooms quickly you want them to brown on the outside. They will take 2 minutes to cook. Transfer to a bowl. Sprinkle half the cheese on a tortilla. Add half the mushrooms, chicken, and bacon. cook for 2 to 3 minutes in the same skillet that the mushrooms were cooked in, flip very carefully. Cook for another 2 to 3 minutes. Repeat with remaining 2 tortillas. Use a pizza cutter to cut each quesadilla into quarters. Serve with honey mustard or your favorite pico de gallo. To add flair, sprinkle a little fresh parsley on the finished dish, if desired. Today I have a secret recipe for a premium side dish served at Outback Steakhouse. 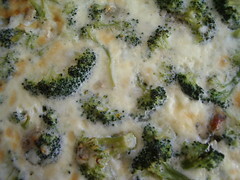 Their broccoli and cheese features fresh steamed broccoli florets topped with an extra creamy cheese sauce. This is a great side dish to pair with almost any entree. The cheese sauce also makes this a great way to get kids to enjoy their vegetables. Add flour and whisk until combined. Cook until fragrant. Add whipping cream and milk, continue to whisk until thickened. Add velveeta cheese and spices, whisk until cheese is melted. Meanwhile blanch your broccoli and drain. Pour cheese sauce over broccoli. Transfer broccoli to small oven safe dishes. Top with shredded cheese. Bake in a 400 degree oven for 3-4 minutes until cheese is melted and bubbly.